5 out of 5 stars SMART, SASSY and FUN! I’m a big fan of werewolves. It’s why I was eager to read WHEREWOLVES by the writing team of John Vamvas and Olga Montes. I was pleasantly surprised to discover that there’s a new wherewolf in town. Not the same old same, it’s a new take on an old theme. Moving at the speed of light, it’s fast-paced and adventurous. With quick wit and incisive descriptions, the characters are fleshed out just enough to make them interesting and ripe for attack. Loved the book and loved the writing team. It’s a good read that delivers! This book is thrilling and fast paced, the type that will have you sitting on the edge of your seat the whole time you are immersed in the novel. I loved the theme of army children and the way that this book reveals some very real problems that these children face in real life every day. It was nice to have a cast of characters where everyone has faults and no one is perfect, this is a very rare thing to come across in the world of books. This novel is very down to earth and realistic and I believe that this is what makes the book so spectacular and believable when the more paranormal elements kick in. There are so many twists to the plot that you never get bored and I have to say that the ending was one of the most thought through and realistic of any horror I have ever read, and one of my favourites. My only down point is that the novel is rather slow to begin and once the action kicks in, it ends too fast, but this only adds to the suspense and build up to that spectacular ending! First off when reviewing a screenplay your thinking has to be different when reviewing a book but since this was converted into a book I had to go in with an open mind knowing that some of the writing may be a bit different than normal. I had read a few of the reviews that had already been written about the book and the description of the book itself made it seem interesting enough that I actually pushed it up on my must read list out of curiosity and boy was I surprised. The book follows a group of students into the woods for what is supposed to be a school event but quickly turns deadly and many of those involved may not be what they appear. The best thing that I liked about the book other than being well written and entertaining is that it kept much of the plot hidden which completely sold me on the entire story. More often than not I can see what is going to happen in the book or at leave have some kind of clue the direction in which a book is going to be heading but not with WHEREWOLVES! I believe that the story that John and Olga have written for us highlights some of the real horrors of the world including relentless bulling that many individuals of all ages face on a daily basis as well as the demons that are hiding inside of us and at some point just snap. I personally love the book and would recommend it to anyone who has yet to read it and will definitely be checking in as their new work hits the shelves in the future. While the book revolves around high school students I would recommend it for older teens and adults of all ages. What a truly magnificent book! I’m nearly 60 but it took me right back to my school days and the relentless bullying I endured. As I read more, I saw how in the right circumstances we are all no more than rats in a maze to be studied by cruel and insidious scientists. Congratulations to John & Olga for delivering such a fine piece of writing. I’ll look forward to reading more from you. The last segment of our spotlight as part of Mari Wells’s WEREWOLF MONTH. Please click on the following link to read the final interview. John Vamvas and Olga Montes interview. 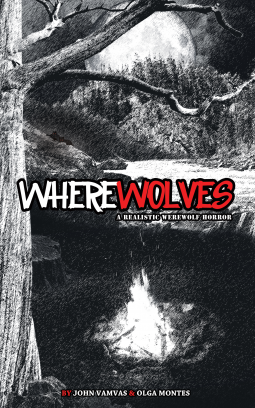 The writing team at Wherewolves The Blog have a great werewolf novel we want to let you know about. By Carole A. Spalino I have to give this five stars because it was really good and it held my interest. It was actually a little unclear as to what the attackers were, what they looked like, and how they came about, but that just added to the intrigue. The story holds lots of excitement and action, and plenty of discord among the characters. Well worth your time, so don’t pass it up. 5 out of 5 stars WAS WOWED! Five-star. A very real very heart stopping book. Just WoW. I can’t wait to read more. Action, secrets, friendship and enemies. What a great story!